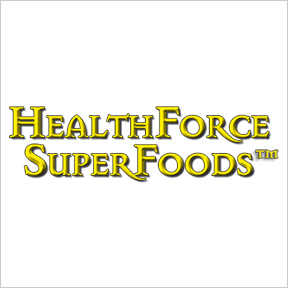 For more than 25 years, HealthForce SuperFoods™ has remained committed to offering the purest, highest potency, cutting-edge products formulated with superfoods, botanicals and natural ingredients for optimal nutritive support. Based on the principle that micronutrients and cofactors contained in whole foods are easily and effectively utilized by the body, HealthForce SuperFoods™ provides therapeutically beneficial nutritional supplements sourced exclusively from 100% whole foods. Proprietary TruGanic™ standards ensure quality, botanical identity, purity, strength and composition, and verify the exclusion of heavy metals, pesticides, insecticides and herbicides, as well as irradiated and GMO ingredients. Products are manufactured according to Current Good Manufacturing Practices (cGMPs) in a Certified Organic, Certified Kosher, NSF audited, registered FDA compliant, vegan and gluten-free facility. All products are free of fillers, synthetics, flow agents and excipients. Their fully reusable and recyclable amber glass packaging helps to maintain the potency and purity of the nutrients. Truly Natural™ Vitamin C: This 100% food-based complex is sourced exclusively from wildcrafted acerola cherry extract, providing 420 mg of naturally-occurring, absorbable vitamin C per serving. Just as found in nature, Truly Natural™ Vitamin C contains bioavailable vitamin C along with cofactors that assist with absorption and utilization. Gluten, corn, tree nut and peanut free, Non-GMO, kosher, vegan formulation. Intestinal Movement Formula™: This non-habit forming, non-cramping, gently effective herbal formula is designed to support maximum colon cleansing, as well as proper digestive and bowel function. Suitable for occasional constipation, the product provides a proprietary herbal blend and a diverse array of vegan enzymes. Gluten free, Non-GMO, kosher, vegan formulation. Vitamineral Green™: This foundational, broad-spectrum superfood complex provides 25 nutrient-dense, synergistic nourishing plant foods grown and processed to maximize their natural and powerful benefits. Included are full-spectrum, naturally occurring, bioavailable whole food vitamins, minerals, amino acids, antioxidants and phytonutrients, as well as soluble and insoluble fibers. Available in vegan capsules or powder mode. Gluten free, Non-GMO, kosher, vegan formulation. Vitamineral Earth™: This one-of-a-kind powdered superfood complex is intended for deep nourishment and nutritional balance. A perfect companion to Vitamineral Green™, Vitamineral Earth™ is grounding, nourishing and detoxifying. Broad-spectrum ingredients include whole-food vitamins, minerals, trace minerals and phytonutrients in support of liver, blood, lymph, endocrine, immune and bowel function. Gluten free, Non-GMO, kosher, vegan formulation.